During a high wind event in January 2006, several motorists reported movements of the bridge superstructure over the Saylorville Reservoir. Since then the Iowa DOT contracted with the Iowa State Univesity Bridge Engineering Center to design and install a monitoring system capable of providing notification of the occurrence of subsequent high wind events. That system is currently running and the process associated with reacting to high wind events appears to be working. 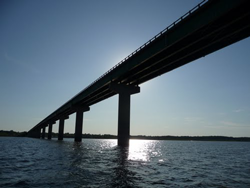 This project will include installation on the the Red Rock Reservoir Bridge a data collection system similar to the one installed on the Saylorville Reservoir bridge. It will monitor wind speed and direction and provide notification to DOT personnel when preset thresholds have been reached.